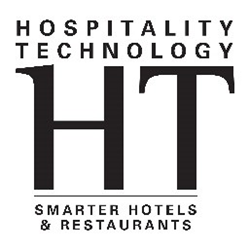 Hospitality Technology (HT) magazine is proud to announce the winners of the 2018 Hotel Visionary Awards. The Hotel Visionary awards honor hotel companies for outstanding achievement, vision and leadership in technological innovation. Every year, HT honors a select group of lodging companies for outstanding achievement in delivering technological excellence. This year’s awards were presented on March 14 during HT-NEXT at the Manchester Grand Hyatt in San Diego, Calif. HT-NEXT combines HT’s Hotel Technology Forum and HTNG North America into one immersive networking and educational event for hotel executives and solution providers. 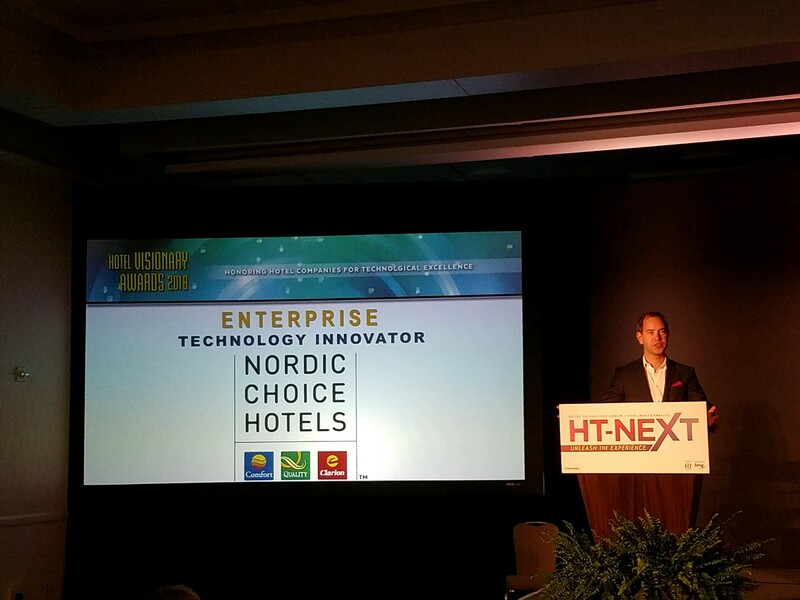 The HT-NEXT Awards program, underwritten by Datatrend, includes the HTNG TechOvation awards and the Hotel Visionary Awards. The Hotel Visionary Awards, now celebrating 14 years, are presented in two categories: enterprise innovation and customer-facing innovation. In order to ensure that companies from across the industry are recognized for their efforts, consideration is given to size, resources and individual market segment benchmarks. Winners are selected by HT editorial staff and members of the HT advisory board on a basis of thought leadership, execution and forward-thinking vision. Hilton, Nordic Choice Hotels, Caesars Entertainment, Four Seasons Hotels and Resorts, and EAST, Miami honored for outstanding achievement, vision and leadership in technological innovation. 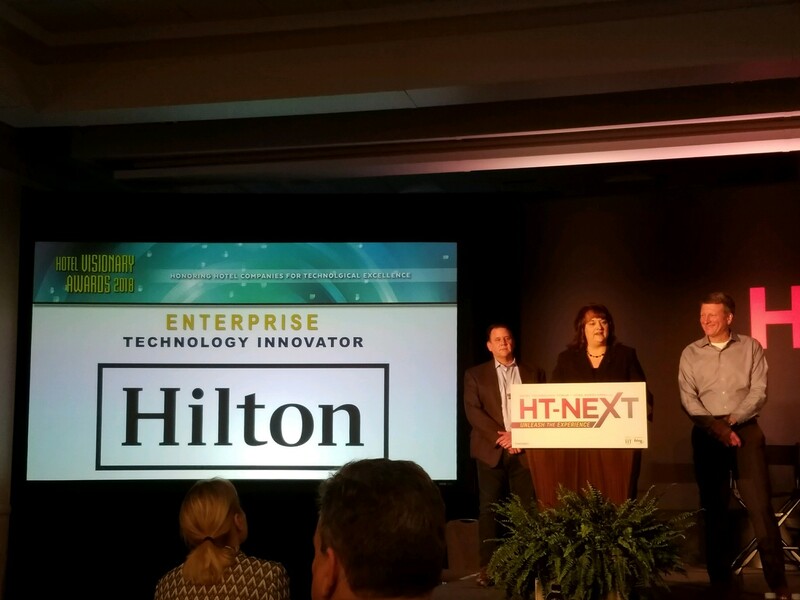 Hilton received Enterprise Innovator honors for its design and implementation of the Connected Room platform that in addition to enhancing guest experience, streamlines operations for Hilton hotel owners and team members. Currently in beta mode and deployed at 1,000 hotel rooms, guests who stay at Connected Room-enabled properties will be able to use the Hilton Honors app to control and personalize the room. On the management side, engineering will have insight into maintenance issues before they become a nuisance to the guest. Also, since hotel rooms are vacant 70% of the time, the Connected Room allows hotels to power down devices, such as the TV, HVAC, and lights when a room is unoccupied, dramatically reducing energy consumption. Nordic Choice Hotels was selected as an Enterprise Innovator for establishing a future-ready framework based on blockchain technology to build a next-generation distribution platform. Nordic Choice Hotels created a sister company called eBerry to follow the progress of cryptocurrencies and blockchain and learn how best to apply these technologies within hospitality, specifically to ensure guests will return and book hotel rooms through Nordic Choice Hotels' own channels. Knowing that its guests value seeing a selection of hotels when planning a trip to a new destination, Nordic Choice saw potential in an open inventory distribution platform. Partnering with Winding Tree, Nordic Choice offers hotel room inventory on a decentralized blockchain platform, opening up a new channel for third-party companies and startups. This allows new companies to create innovative services for its guests without having to go through aggregators or sign individual contracts with every supplier. Guests will continue to pay with a credit card on the website or at the hotel, unaware that their booking is being channeled through blockchain. The platform has been implemented at the Hobo Hotel with plans to roll out company-wide in the near future. Nordic Choice believes that this technology will ultimately reduce costs associated with OTA fees while also creating new possibilities for startups. "Our ambition is to be at the forefront of digital development and implementation of new exciting digital services. All in order to offer our guests the most seamless experience possible. Testing blockchain as a new type of distribution channel adds an extra dimension and knowledge that creates new conditions for raising the service level for our guests” said Christian Lundén, director of future business, Nordic Choice Hotels. "To be selected as a winner among so many other great initiatives is proof that we are on to something exciting and may change the map of distribution in the future. We are so honored to be selected as winner for this award!" Four Seasons Hotels and Resorts was named a Customer-Facing Innovator for its development of a custom chat platform that is available in more than 100 languages and offers 24/7 service. Accessible on a range of messaging platforms, including the Four Seasons App, SMS, Facebook Messenger, WeChat, and Kakao Talk, guests are able to interact with the hotel on their preferred platform. Four Seasons Chat is powered by real Four Seasons staff, in real-time – it does not rely on chatbot technology. Four Seasons piloted the chat platform in April 2017 at 30 hotels and resorts and found that more than half of guests introduced to the service used it on their first day. Those same guests also engaged with Four Seasons more regularly, averaging more than six chats a stay. By the end of 2017, Four Seasons Chat had been rolled out to 74 hotels and resorts worldwide. Boasting response times much faster than industry averages, 95% of messages receive responses under five minutes, and 75% receive replies in 90 seconds or less. The rollout fostered a 25% increase in guest satisfaction on the mobile app, and 51% chat engagement for those aware of the platform. Caesars Entertainment was chosen as a Customer-Facing Innovator for its deployment of Ivy, an automated guest engagement platform. Now live in more than 6,000 rooms, Caesars Entertainment is the first major gaming company in Las Vegas to offer a widespread guest text messaging program with built-in artificial intelligence (AI). The average resolution time for manual guest text messages is less than one minute. Ivy also surveys guests during their stay, which allows for quick recovery of unhappy guests in real-time. Guests can continue to text with Ivy once they return home to obtain a copy of their folio or locate a missing item. Guests who engage with Ivy rated their overall experience an average of five points higher than guests who knew about Ivy but did not engage. EAST, Miami was chosen as a Customer-Facing Innovator for its creation of a modern intelligent hotel ecosystem by implementing innovations to secure, streamline and personalize the guest experience. A robust mobile app enables a seamless experience allowing guests to book a room after seeing real-time rates and availability, check-in, bypass the front desk with mobile key, make reservations at on-site restaurants via an integration with OpenTable, and discover local attractions, restaurants and nightlife. EAST, Miami also installed hardware to allow guests to securely cast content without having to download apps, scan QR codes or take additional steps. Through a world’s first integration between AssaAbloy and Otis platforms, EAST, Miami was able to secure elevators and intelligently restrict access to certain floors and areas at certain times. "EAST, Miami is proud to offer guests cutting-edge technology even before they step into our lobby," said Mihai Bote, CHTP, director of technology, Swire Hotels. "With a next generation native mobile app for both iOS and Android platforms they can enjoy features like mobile check-in or mobile key, in-room content streaming or benefit from frictionless secure destination elevators. Here at EAST, Miami, and at Swire Hotels as a whole, we are confident that innovative technology is essential to the functionality of the modern intelligent hotel ecosystem, so it is an honor to have these efforts recognized."